Americolor White and Black Soft Gel Paste food colouring, and paintbrushes. 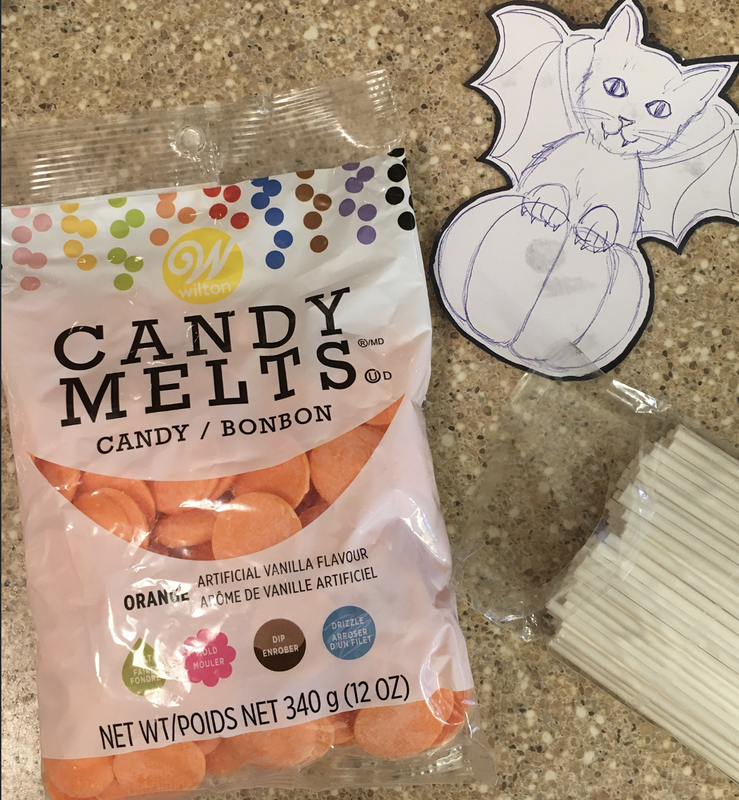 Wilton Candy Melts in Orange, or use orange royal icing to pipe rose swirls. 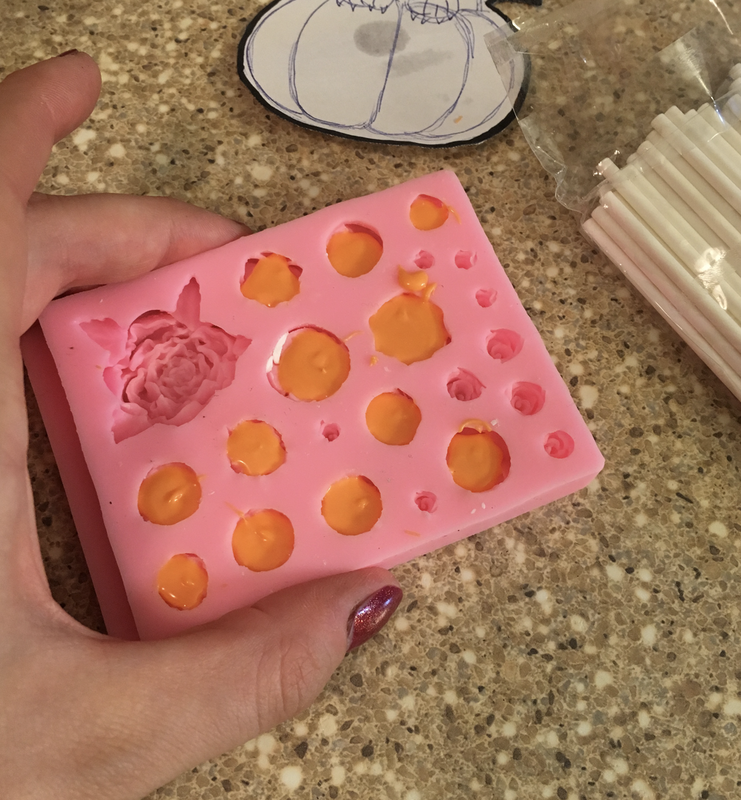 Rose Candy Molds (I used this one: Roses) - you don't need these if you want to pipe on the roses with orange royal icing. Print your template and cut it out! 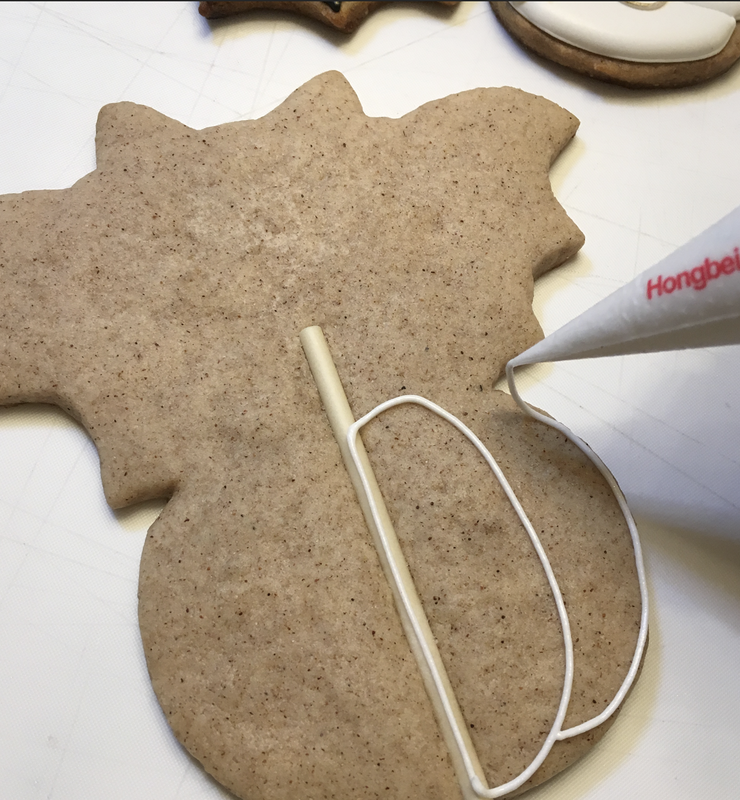 Use the template to cut out your cookie shape from the dough. Put the lollipop stick on the front of the cookie dough! 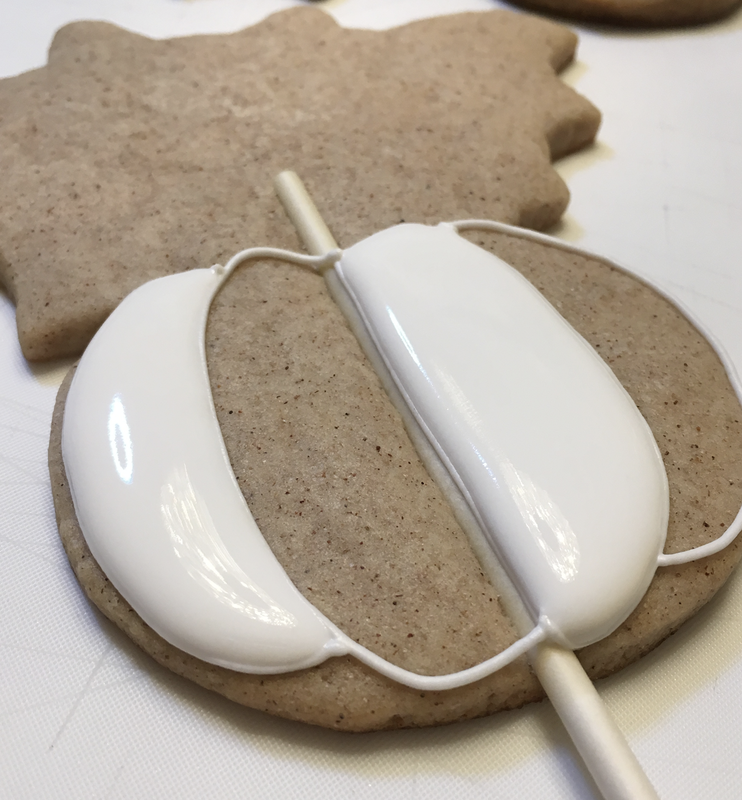 This way, when you decorate your cookie, the stick will be sandwiched between the cookie and the dried icing, and it will be super secure! While your cookies are baking, prepare your candy melt roses. 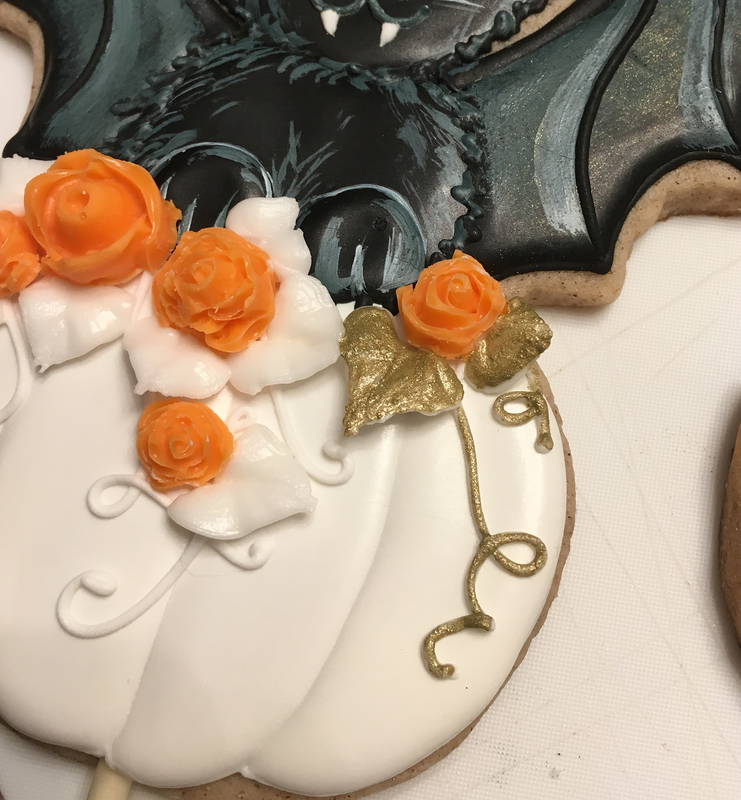 If you plan on piping orange rose swirls with royal icing on your cookies, you can skip this whole step. 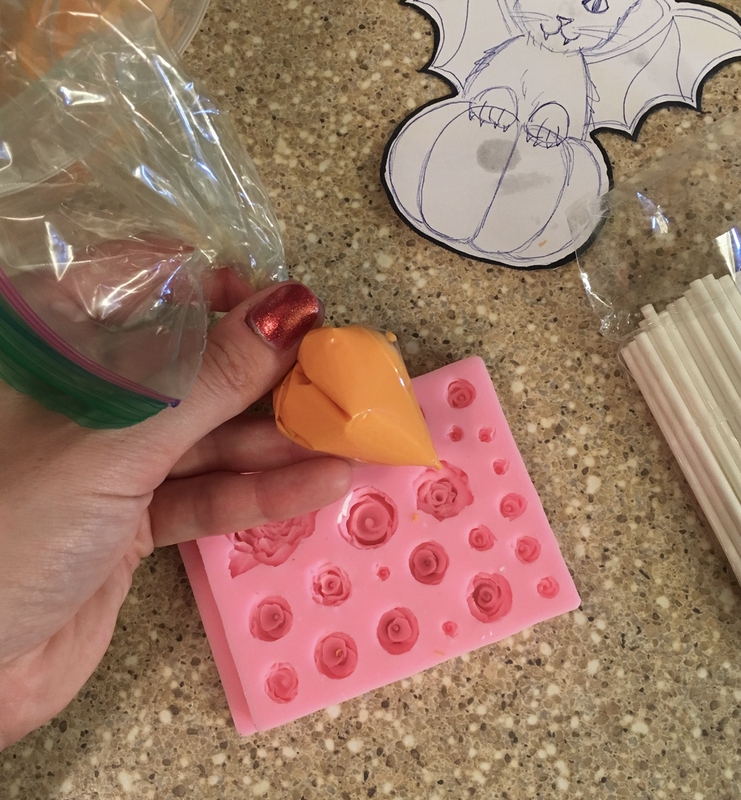 Carefully melt your candy pieces, and use a small ziplock bag to pipe it into the rose molds. You may need to give your mold a couple good whacks on the counter in order for it to settle into the mold. Place into the freezer to harden. 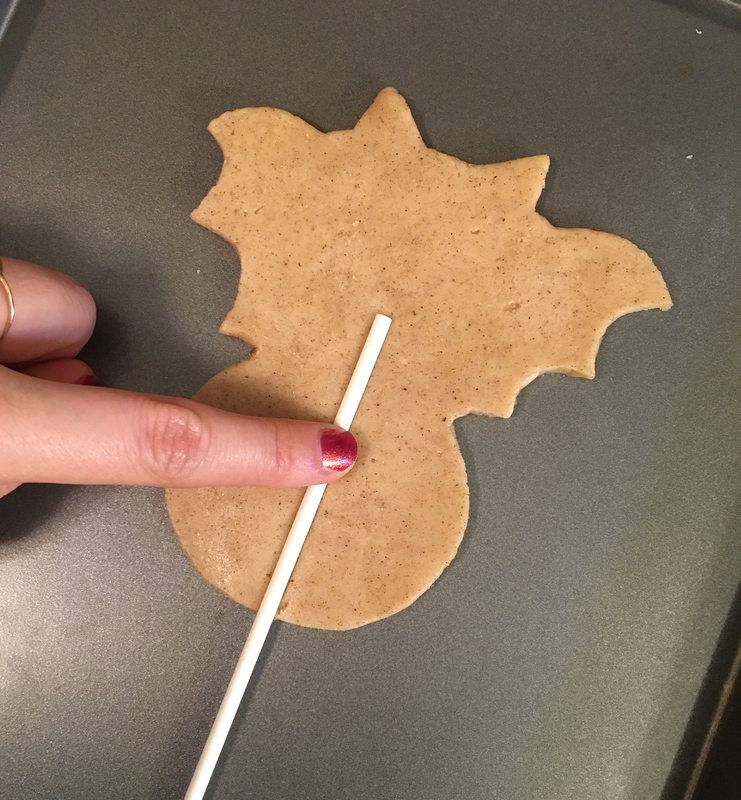 Now that your cookie pop is baked, get your piping and flooding icing ready for decorating! 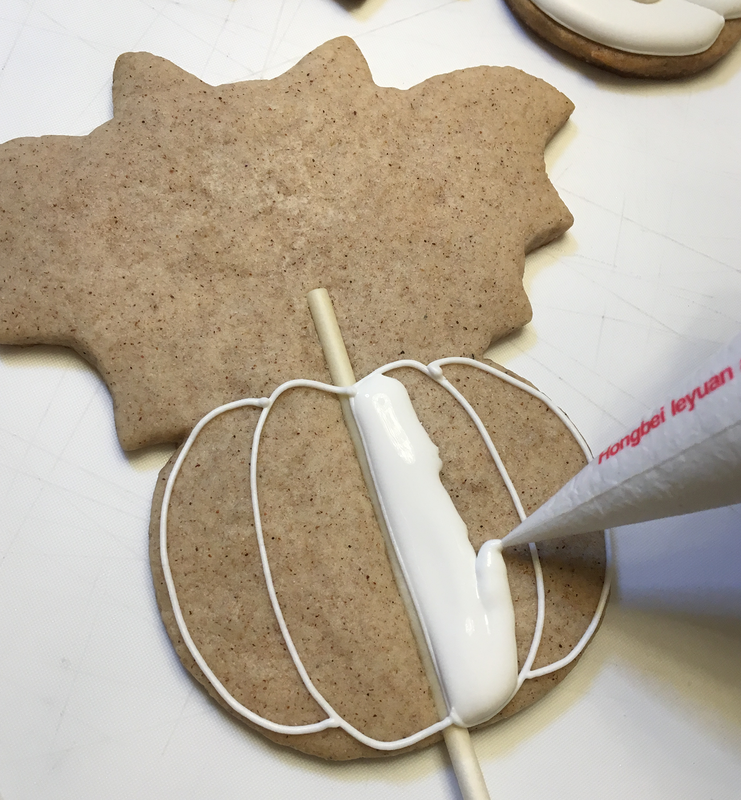 Use your white piping icing to outline the pumpkin shape first. ..like this! Wait for these areas to dry before flooding the rest of the pumpkin. Use your template as a guide to pipe and flood the head. ​Outline the body and the bones of the wings. 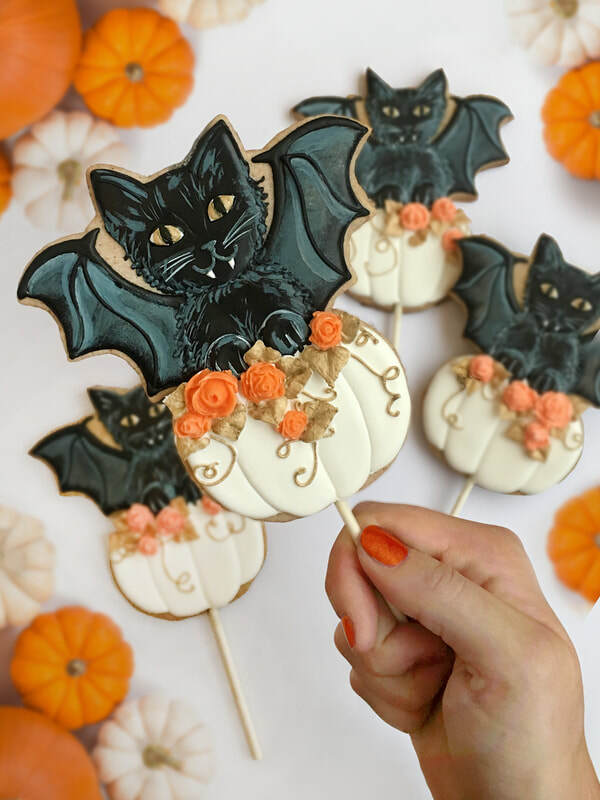 Before proceeding with flooding the bat wings or body of the cat, flood the rest of your pumpkin! Now you can flood the wings! Allow 10 minutes for the wings to begin to dry before flooding the body. Once the body of the cat is relatively dry. Pipe on the paws! And now we begin decorating the kitty! 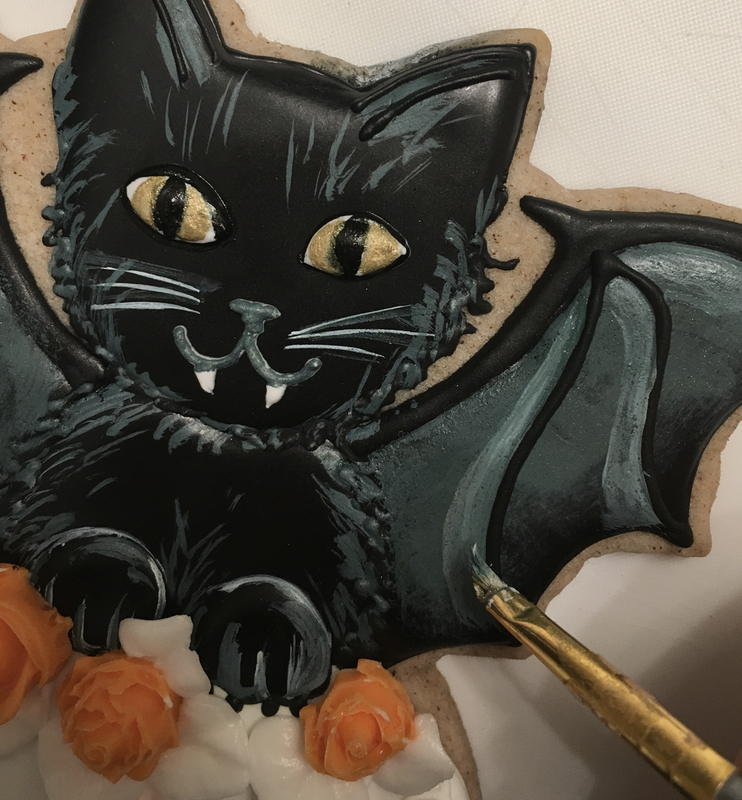 I used my piping icing to add some furry texture to the edge of the cat's body. 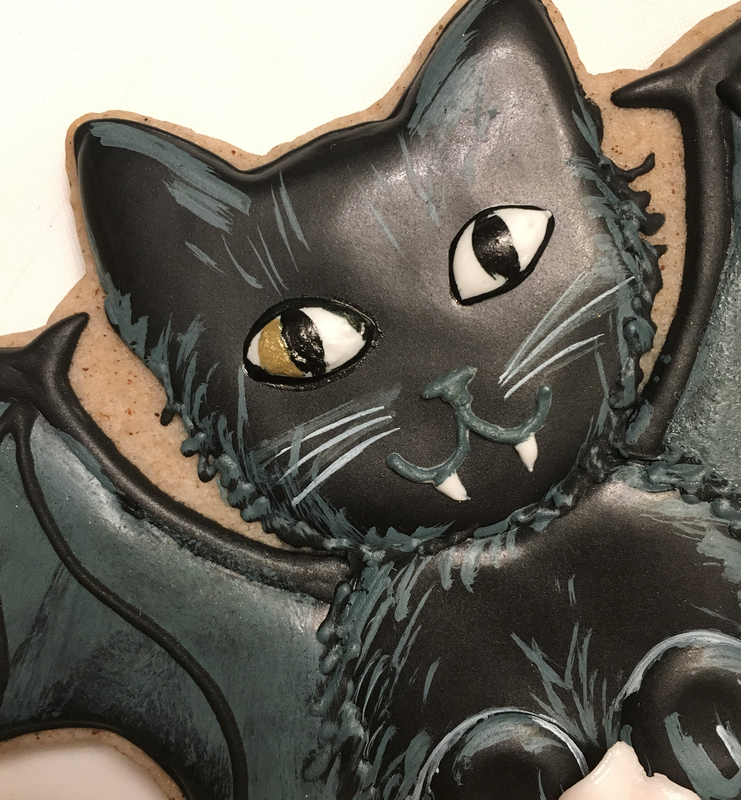 Use your white piping icing to create the eyes, nose, mouth, and vampire fangs. And you may as well use that white icing to do the curly pumpkin vines now too! While those areas are drying, combine a small mixture of your black and white food colouring in a painting palette with a tiny splash of vodka to create grey edible paint. Use the grey paint and your paintbrush to add some fur strokes to the body the cat. 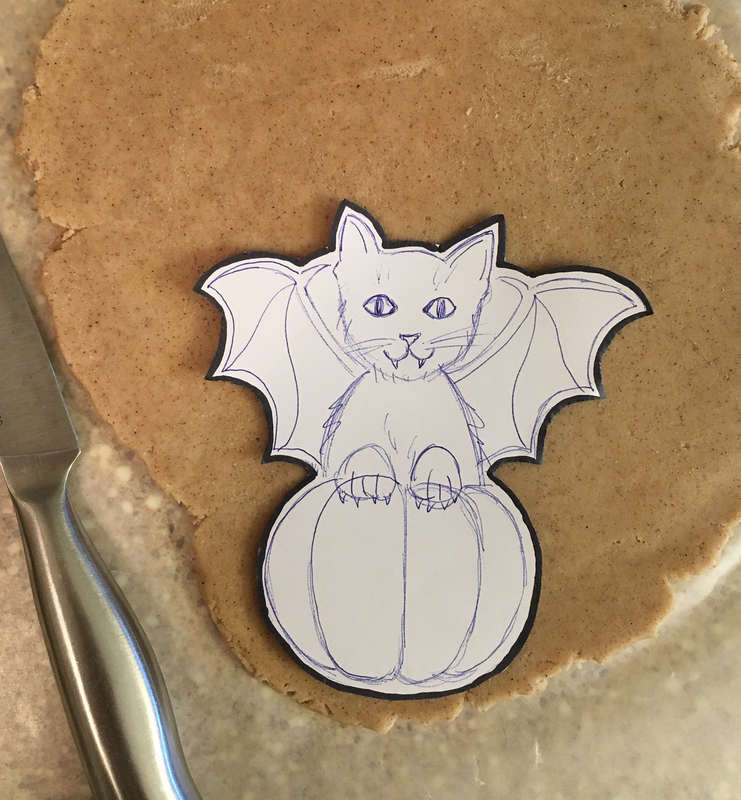 Blend some grey into the wings of the vampire cat. 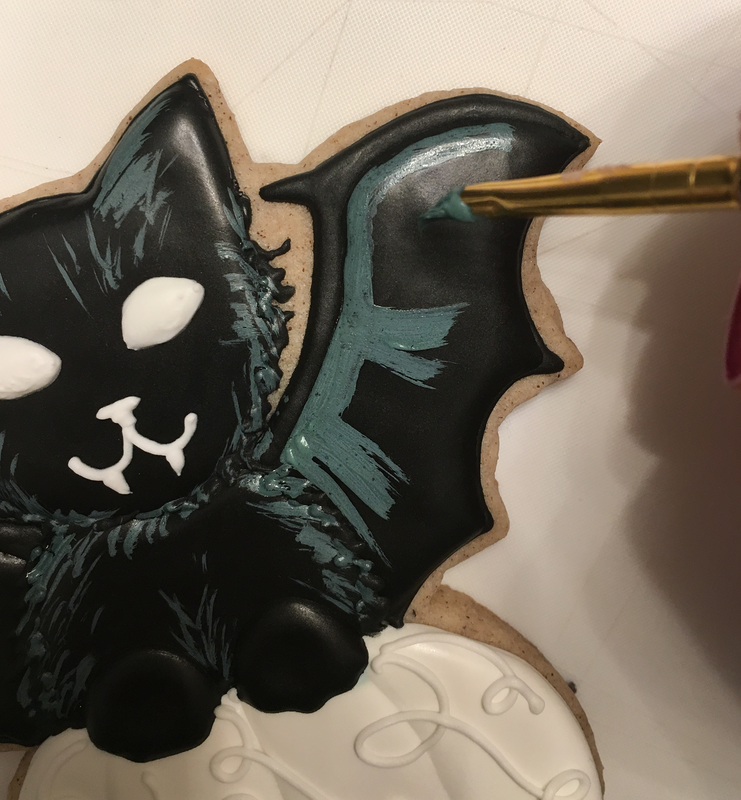 I also used the grey paint to go over the nose and the mouth of the cat. 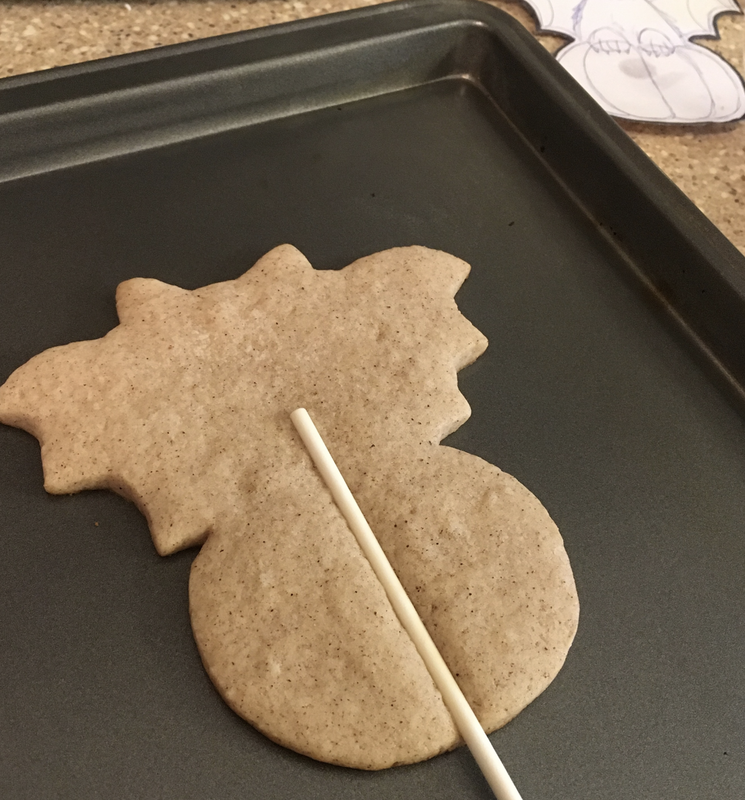 This is just easier than making grey piping icing for such a tiny little area. 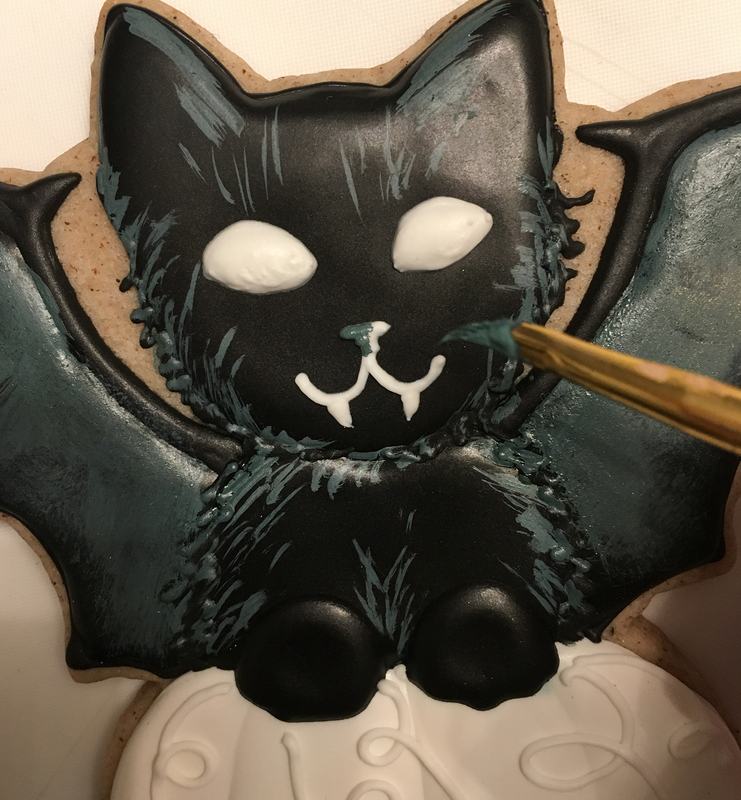 And don't forget to add details to those cute little paws! 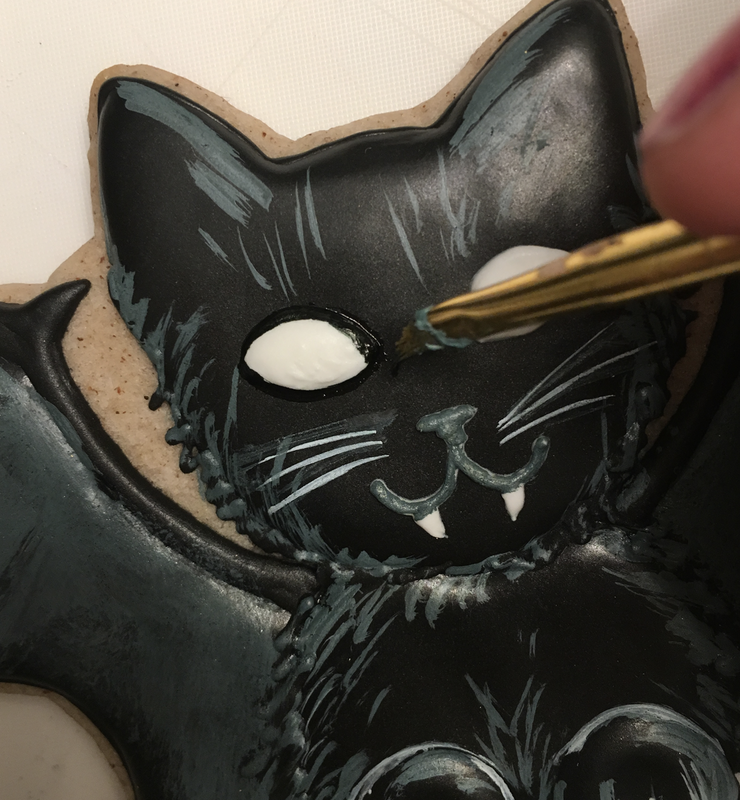 Use the black food colouring to outline the cat eyes and paint the slitted pupils. Pipe on the final bone details of the bat wings. I chose to use gold for the cat eyes, but you could also use green colour if you dont have any gold handy! 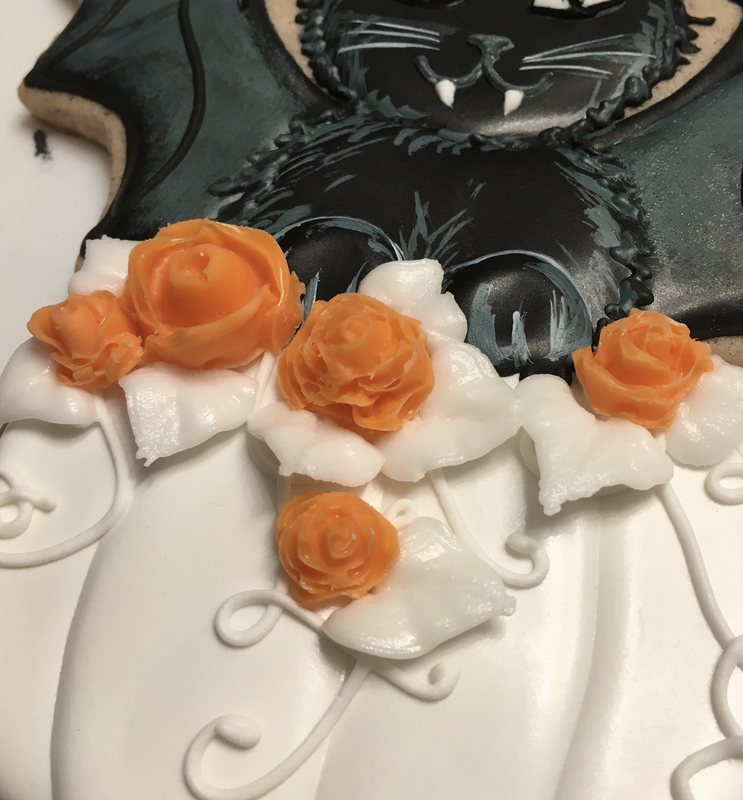 It's finally time to pop those roses out of the mold, and use a bit of white piping icing to glue to the top of the pumpkin. Use a bit of white food colouring to highlight around the lengths of the wing bones. And last but not least, use your gold to paint the pumpkin vines and leaves!